AUSTIN, TX--(Marketwired - Jul 22, 2015) - Dr. Adam J. Mamelak and Dr. Miriam L. Hanson are board-certified dermatologists who are dedicated to keeping their patients' skin healthy and beautiful. However, the newest procedural offering at their Austin dermatology practice aims to go a little deeper. For patients who are at or near their ideal weight but still struggle with stubborn areas of fat, CoolSculpting® can help them achieve a more toned and defined silhouette. "Many people adhere to strict diets and rigorous exercise regimes," says Dr. Mamelak. "However, it can be frustrating when you exert so much effort only to discover that some isolated pockets of fat around the abdomen and thighs remain unresponsive." CoolSculpting® is a non-surgical FDA-approved method of fat removal that can serve as an alternative to liposuction. In addition, since this body sculpting treatment is non-invasive, there is typically little to no associated downtime. The Austin dermatologists explain that the treatment differs from other contouring options because CoolSculpting® can eliminate fat cells permanently. This is possible as the targeted fat cells undergo a process called Cryolipolysis®, which causes fat cells to crystalize. Afterward, the body's metabolic process can gradually remove these fat cells from the body for long-lasting results that look natural. Since it takes time for the fat cells to be filtered out through the body, the final outcome from a CoolSculpting® treatment may not be visible for three to four months. Drs. Mamelak and Hanson note that patients can begin to see results as soon as eight weeks after treatment, and a second CoolSculpting® treatment can be performed to further enhance the outcome. For patients who seek a slimmer body and more defined contours, they emphasize that CoolSculpting® can serve as a fast solution without the need for surgery. Sanova Dermatology aims to offer innovative solutions from experienced, compassionate professionals. 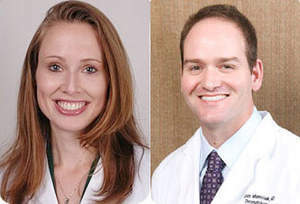 The practice is operated by board-certified dermatologists Adam J. Mamelak, MD, FRCPC, FAAD and Miriam L. Hanson, MD, FAAD. Renowned for their expertise in skin cancer diagnosis, as well as performing the advanced treatment method of Mohs surgery, these dermatologists provide a full range of skin care services including the treatment of skin abnormalities and a variety of cosmetic procedures. Drs. Mamelak and Hanson are available for interview upon request. For more information about Dr. Mamelak, Dr. Hanson, and Sanova Dermatology, please visit sanovadermatology.com, facebook.com/sanovadermatology, or twitter.com/DrAdamMamelak. How Can I Reduce Stubborn Fat Without Surgery?